ok. we are moved in and settled (this happened a few days ago) and we love the extra space. the real snag is the mystery smell that kills me every time i walk in the door. naturally. let me try to explain what this smell is like. 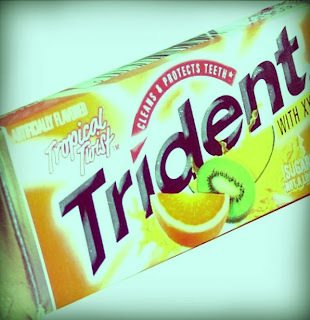 but all my pals (well, some of my pals) thought this gum was the bomb. well. that's it. that's what our apartment smells like. that and a little musk and you have it! i am a little bit obsessed about apartment smells. (as in i don't want it to smell. unless it smells good. in that case - ok.) this is killing me. p.s. not real sure if i should include this little tid-bit. but.... well. anyway - we might have watched Slumdog Millionaire. and we maybe really really liked it. p.p.s. another aftereffect of the move is that i have totally misplaced every single nail file (well. i i guess i only had two.) and every freakin single nail clippers (jason had about ninety-nine of those.) what the? Wow, you've got a lot of troubles. I don't know what to tell you to do. I have to admit that I too watched Slumdog. I'm not an unedited rated R movie watcher (EVER) but I did my research before watching it at to be honest I thought it was cleaner than the last 10 PG-13 movies I've seen. I honestly don't even know why it is R. And I thought it was pretty good too. Now I want to go to India more than ever. i loved slum dog millionaire too! oops. Maybe you should try to Febreze the S-H out of the place... namely the carpet. It could help! Good Luck!! I think the Easter Bunny brought Toby that movie and had no idea it was rated R... I mean it came highly recommended by my own father! Just get yourself a Scentsy and plug that baby in. They are pretty powerful. I know a few sale reps if you are interested. And to the rest of the rated R sinners out there....Shame on you! You could buy a whole box of those scent packets that everybody that comes to Mini wonders what that good smell is?? If one is good, a whole box would have to be great....right?? I'll have to check to see if there is a fruity one for you, though! The STINK is the pits. I don't have any suggestions that you haven't already tried other than maybe just start cooking some great smelling stuff. Use a little garlic or bake some bread. Becky had a good idea to aim for the carpet. Maybe you can get some of that odor neutralizer (it's for pets or something) that you put on the floor and then vacuum up. I'm a big 'walk in and smell' person too. I'm so so sorry. oh yikes! glad i didn't stop by to see you guys last week after all. let me know when the stank wears down and i will come over then! ha sorry but not kidding!